For two seasons we have been lucky to have Felix staying up the river, helping out tremendously, while working on his university projects. Many of his amazing shots can be viewed on his website. Transient orcas generally form smaller and more variable social groupings than residents, roam over a larger area of the coastal waters, and their appearance in particular places is not so predictable. They feed primarily on sea mammals such as seals and sea lions. The name “killer whale” probably stems from observations of transient orcas hunting. 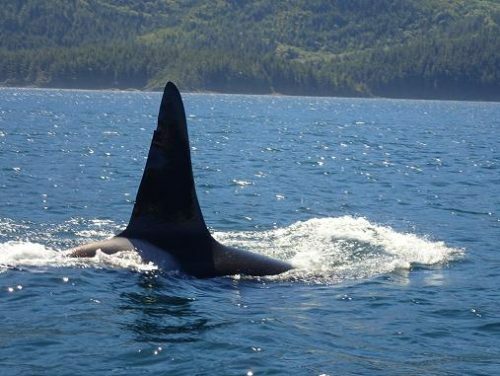 Transients are characterized by more triangular and pointed dorsal fins than those of Residents (because they have a broader base), and their saddle patch is generally solid. Based on differences in their lifestyles and food preferences, orcas are characterised as “resident” and “transient”. 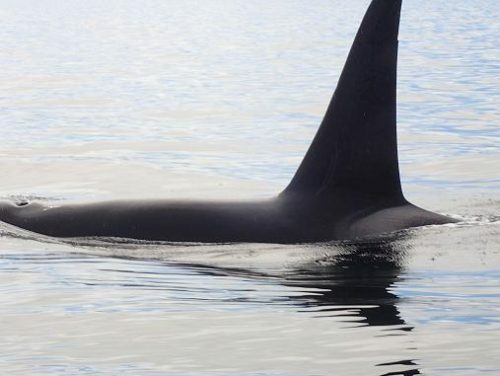 The majority of orcas that visit our area area are called “residents” because their appearance in the area each summer and fall is relatively predictable. 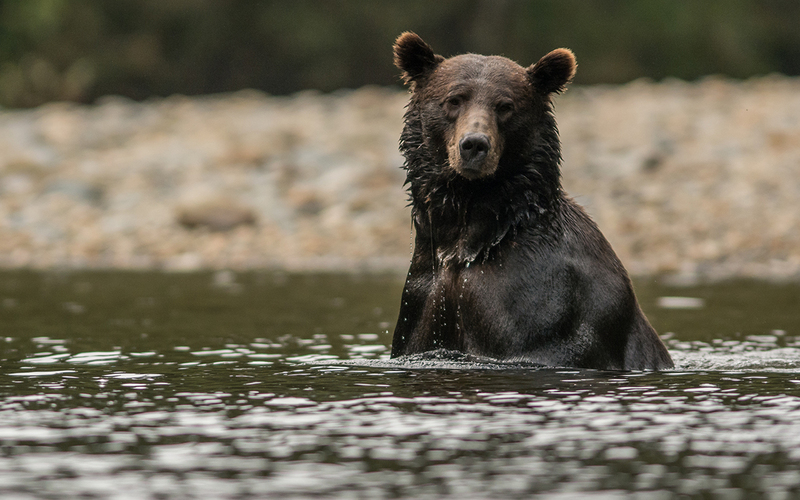 They feed on salmon, live in close and extended family groups (matrilines and pods) and are highly social. Families can be distinguished from one another by their dialects. 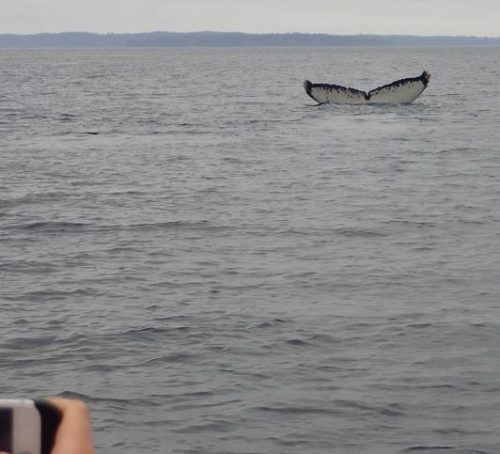 And later in the day after a stop at Telegraph Cove on Vancouver Island to use a “civilized” bathroom we were visited by some humpback whales. I try and eat our picnic lunch is an area where the humpbacks are feeding and wait to see what “pops up”. 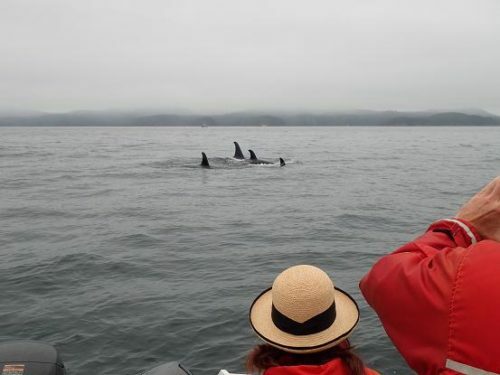 Yes we did find the killer whales and spent an hour or so with them as they moved through Blackfish Sound. The guest photos from the day were much better than mine. I know this because it is part of the day that photographs are compared once all guest return to the lodge. In my defence I am more interested in getting photo that make for a good blog posting than the ideal photo to show friends (I have enough of those). 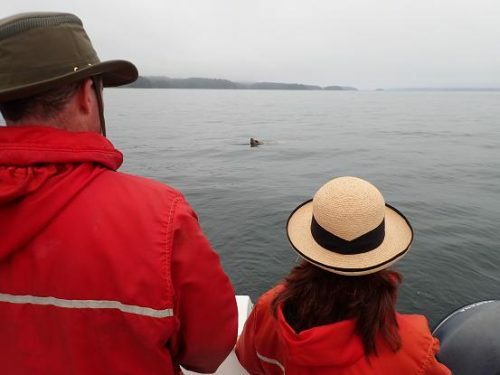 We were working our way up Blackfish Sound looking for some killer whales reported to be in the area when we came upon a Steller sea lion. This sea lion cam within 5 meters (yards) of the back of the boat, of course I missed that photo. Sea lions are very curious and if you sit quietly in a boat they will approach quite close. 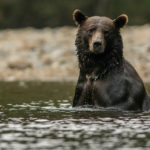 This day started with a black bear on the beach in Clio Channel behind the Grizzly Bear Lodge. 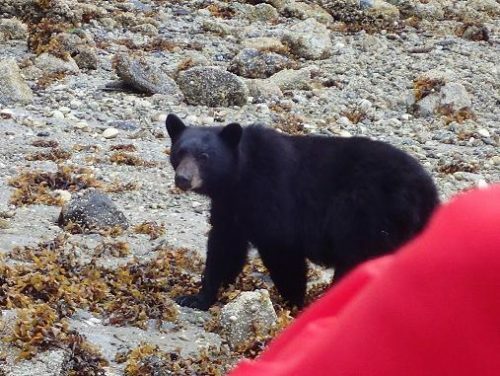 It was a very obliging bear in that it did not mind us getting good photographs. My goal when watching any wildlife is “to leave it as I find it”. If you cannot do that you are disturbing the flow of nature and the economic sense is that it will not be there the next time one wants to watch. 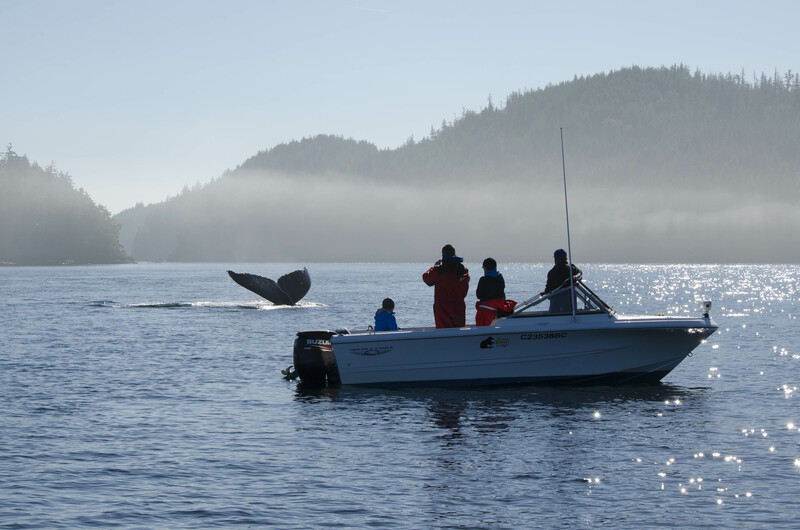 Some of our guests were very lucky to have a great phot opportunity with this Humpback Whale on a beautiful morning in Blackfish Sound. 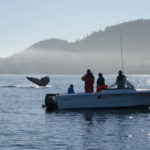 These whales frequent our waters during our season to feed on krill and small fish, such as herring. I hope they managed a good picture. 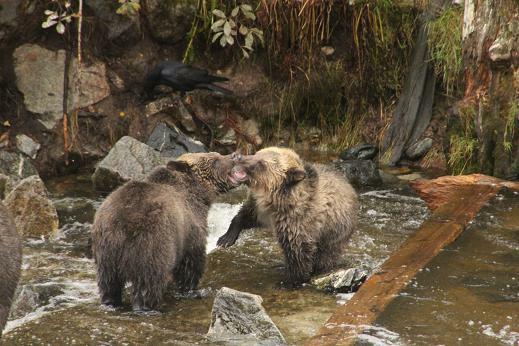 It is always rewarding to watch bear cubs with their mothers feeding on salmon in the fall. 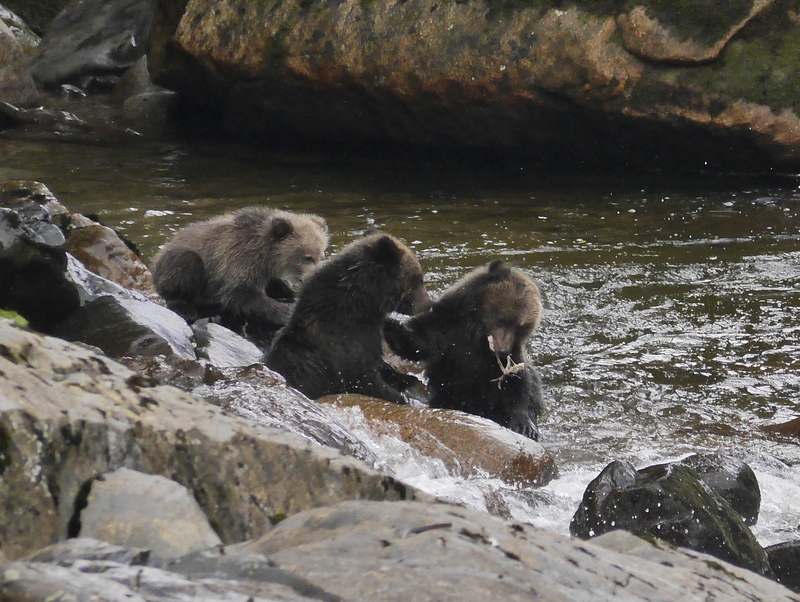 It starts mostly out of boredem as the cubs wait for their mother to catch a salmon. Notice the crow in the background picking up pieces of salmon. 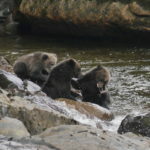 That is where the mother grizzly shares the samon with her cubs. Also notice in the lower lefthand cornes of the photo mother’s backside.